We Specialize in Grandfather Clock Housecalls! Call It's About Time Shop Today! 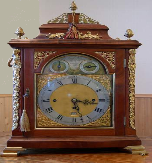 Clock Repair Virginia, Clock Repair Maryland, Clock Repair D.C.
WE TAKE FINE CLOCKS ON CONSIGNMENT! American Watch and Clock Institute (AWCI). D.C. edition of The Examiner.